Coaching has come a long way in the last 10 years or so. In the early to mid 1990’s only a handful of executives in only the largest of companies had any kind of formal coaching from an external source and even in these cases perhaps only as a “special” project of limited duration, not as an on-going relationship. Even in more recent times, as coaching has penetrated organizations of all types and sizes much further, there has not always been much in the way of a common methodology or approach, with many coaches being happy to act as a general sounding board, and “float” in the direction that the senior executive pointed. However, this “loose” approach is rapidly changing and we are now seeing much more in the way of outline models being used to help guide the coaching process. This article therefore reviews some of the more common approaches now being used and attempts to assess how useful they seem to be. The coach and person being coached will discuss the current situation and reflect on personal, as well as team or organizational goals for the future. The process continues until the targets have been substantially achieved. At this point, the relationship may end or it may be decided that the cycle is worthy of repeating with new reflection and goal setting. Although some assignments may have many more stages than this, these tend to be sub-steps of the above. As a result, these six stages are usefully descriptive for our purposes, although they are far from equivalent in time and effort (as we will see). In broad terms, the above 6-stage process can be split into 2 halves. The first 3 stages involve what we can call “input-based coaching”, while the last 3 stages involve what we can call “output-based coaching”. Not only are these two types of approach very different, but the models that are often used in each of them are quite distinct. Input-based coaching, as the name suggests, is primarily concerned with soliciting and processing feedback. Apart from the coach, this will come from the individual being coached, the boss, colleagues within the organization, and, in some cases, from the people reporting to the person being coached. The simple goal here is to gather a considerable amount of data or opinion about the person who is receiving the coaching so as to ensure that there is as rich an understanding as possible about strengths, development needs, positive and negative behaviors and other factors which may affect job (or overall) performance. Because input-based coaching is essentially focused on reflection, the tools and models for helping individuals here are either mechanisms which help to structure or make sense of the feedback (such as psychometric profiling tools or pre-designed 360°feedback assessments), or well-established models which help to give a coach and the person being coached “permission” to talk about what might otherwise be a difficult or sensitive issues. As often as not, these latter models are 4 quadrant grids, which intersect two scales to help cluster behavior in general ways. This thereby allows for further discussion about behavior in particular quadrants in the grid. Output-based coaching, once again as the name suggests, is primarily concerned with what the individual being coached actually does or achieves in tangible terms. 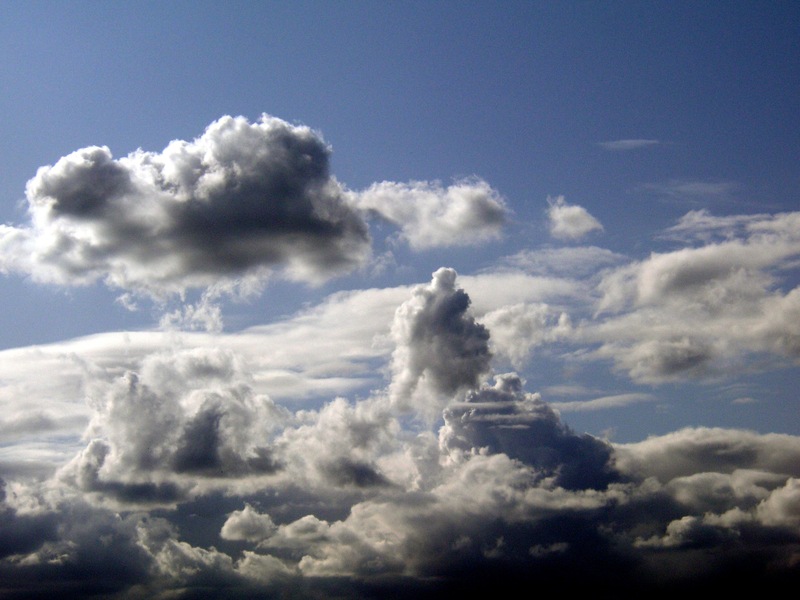 This may be to effect some level of personal change (which may be known only to the individual and his or her coach). However, if it is to be classified as truly output-based, the change should be visible to others and/or be observable in measurable ways in the workplace. Because output-based coaching is concerned with what changes in the individual or in the workplace in visible terms, it is essentially an action-centered approach more concerned with the attainment of real solutions and what are deemed to be valuable results or solutions. The tools and models which are therefore most often applied here are process type approaches. This includes progressive process step type models and formula-based models (some of which we will be looking at shortly). The reason for splitting the coaching intervention process into these two categories of input and output-based is not just to create a convenient cluster heading for all that might be done in each, but to make the point that modern coaching tends to be extremely biased towards the former. In other words, the amount of effort and time invested in input-based coaching is often 2-3 times greater than outcome-based coaching and we are therefore wise to question whether or not this is appropriate. Self awareness based tools. This includes psychometric instruments such as Type or Temperament profiles (such as Myers-Briggs Type Indicator®, the PTI or the Kersey’s Temperament Sorter). Other popular tools in this category are the Human Element FIRO® assessment, Cattell’s 16PF and Neuro-Linguistic Programming or NLP. 3rd-party feedback tools. This includes frameworks which seek to assess individual skills and competencies . Popular tools in this category include are the Leadership and Management Effectiveness profiles, Harrison Innerview assessment, Strength-finder assessment and Schein’s Career Anchors profile. “New Insight” tools. This typically includes behavioral grid type frameworks which aim to allow individuals to look for both strengths and development t needs according to the particular model. Examples of popular tools in this category include Johari’s window,Berne’s “OK Corral” model, and Hersey and Blanchard’s Situational Leadership® Grid. An effective coach will typically use one tool from each of the above categories (often based on his or her personal preferences, prior training or general familiarity with the approach). The implication therefore is that a given individual undergoing coaching may be exposed to at least 3 significant feedback processes, and sometimes these may involve three to four meetings each-making the input data very deep but potentially quite time consuming. Particular coaches may invent their own coaching process model or use methodologies developed by management consultants or academics who are experienced in the coaching sphere. The “Action-learning” model, expressed as L=P+Q (or Learning=Programmed Knowledge plus Insightful Questions) proposed by Professor Revans is one such model often used. Others are the “GAPS” model, developed by Hicks and Peterson (Goals, Abilities, Perceptions and Standards) and the “GROW” model, developed by Alexander and Whitmore (standing for Goal, Reality, Obstacles and Will). In fact, the GROW model has also been adapted by some coaches, who often augment the model. One example is the “GROWTH” model developed by O’Bree and Campbell (which adds the categories of Tactics and Habits). What is common to all the models mentioned here is that they attempt to create a progression or “bridge” for the individual being coached. If successful, this takes them from the reflective phase of the coaching intervention to the point at which tangible change at least starts to happen. Unfortunately, while the intention may be laudable, the reality is often that individuals often “stay on the bridge” and do not get to the other side. This is frequently because all of these models still put significant stress on the personal input side of the equation and therefore may cause a person being coached to become overly consumed by the feedback they are getting (and either want to spend time dealing with it or squeezing up the time they have for action). In some cases (the “GROW” model being a good example) even the steps proposed are mainly input side oriented. The GROW model suggests mainly personal or inner challenges at the “G”, “R” and “O” stages and even with “will” it is essentially a thought process about how to become motivated to act. It therefore seems that we need to go further, if we really want substantive change to occur. While there are a plethora of input-based coaching models, there are relatively few output-based coaching models. This is partly because the input-based approaches have been popular in the last decade or so. However, it is also because such output-based models are still evolving in the executive coaching field. There are 4 models that attempt to describe a more action-oriented coaching process. 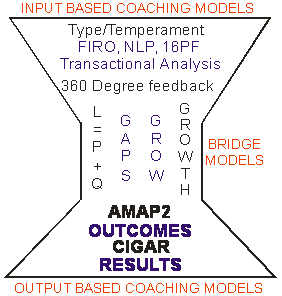 These are “aMAP2™”, “CIGAR”, “OUTCOMES™” and the “RESULTS™” model. Let’s look briefly at each of these. The “aMAP2™” model, developed by Devers and Kulesa, attempts to be a transformational process to use when coaching an individual. It stands for Action by Motivating, Awareness and Possibilities using Powerful questions (and therefore has similarities to Revans Action-learning methodology). The “aMAP2™” approach is clearly implementation focused in asking both the coach and the person being coached to consider change issues. However, in its application individuals may still be led towards greater reflection than doing something differently (unless led strongly by the individual coach). The “CIGAR” approach was evolved by several consultants using the GROW model. This acronym stands for C-Current situation, I -for Ideal outcome, G-for the gap between C and I, A –for action plan and finally R –for Review. On the surface, the CIGAR model is well-balanced in its steps. However, in practice, too much stress is often placed on current problems and ideal solutions, rather than practical options which can help the individual to move positively forward. The “OUTCOMES™” model, developed by management consultant and executive coach Allan Mackintosh, has similarities to the “GROW” model in some of its aspects. However, it particularly attempts to stretch into the “action sphere” by adding 3 steps at the end, all of which are focused on creating much more general impetus for change. The steps of the OUTCOMES™ model are: O = Objectives. U = Understand the Reasons. T = Take Stock of the Present Situation. C = Clarify the Gap. O = Options Generation. M = Motivate to Action. E = Enthusiasm & Encouragement. S= Support. Like the “GROW” coaching model, the “OUTCOMES™” process still provides no real stages for implementation, actual adjustment or review of post-change success. This perhaps is where the “RESULTS™” model, developed by Warner Results Coaching, is the only model to have multiple steps in this area. R=Reflect -Take time to think, ask questions and re-frame, E=Evaluate -Carefully assess all the forward options , S=Strategize -Select the plan(s) with the best chance of succeeding, U=Understand -Appreciate what resources will be needed to succeed, L=Listen -Pay attention to the input of employees and colleagues, T=Take Action -Implement plans and follow-though persistently, S= Systematize -Ensure that processes are permanently changed. There is no doubt that both “input-based”, “bridge” and “output-based” coaching all play a valuable role in helping managers at all levels to gain helpful insights and to increase their overall contribution or performance. However, in this article we have been advocating that the balance of effort (in time and resources) has been too much skewed to the “input” side of things and in fact may be wise to establish a more balanced approach. This diagram suggests that an individual being coached is effectively “processed” from top to bottom, with input-based coaching models being used initially or at the beginning of the coaching journey and output-based models used at later stages in the particular intervention, or more towards the end. Bridge coaching processes can stretch themselves along the path on occasions but in the main tend to occur towards the beginning and in the middle of an intervention. As we can see, input-based coaching dominates both coach and the recipient executive time and effort, leaving output-based interventions highly squeezed. This simply means that the early feedback processes need to be not only shortened somewhat but should be more future focused in terms of changed behavior or processes that would be beneficial down the track.